Guns, family and The Sontaran Stratagem/The Poison Sky (2007). | Randomwhoness: a Doctor Who blog by Johnny Spandrell. Sampling stories in random order. Guns, family and The Sontaran Stratagem/The Poison Sky (2007). It’s a funny old thing, this random selection of stories. Initially, it can be quite difficult to imagine what there is to say about the latest pick. So it was with The Sontaran Stratagem/The Poison Sky. Not a story I’ve thought much about since its initial broadcast, and not one I thought of as particularly remarkable. But then I rewatched it and, of course, there’s oodles to talk about. How about the unusual pairing of the Doctor with two female companions? How about the revival of classic series heavies the Sontarans? How about that the story’s unusually varied colour pallet gives it a sugary, rainbowy look making it look more like children’s TV than ever before? Or how about the underlying theme of geeks versus bullies? But what I’ve landed on is the Doctor’s relationship with the military, and how this story pitches it in a way which makes the Doctor seem like a hypocritical jerk. That’s not what I remembered about this story. Nor is being a jerk my abiding impression of David Tennant’s quicksilver tenth Doctor. Overall, I’d say he’s charismatic, fun loving and charming. And watched episode after episode, I think that impression is reinforced and becomes the norm. But watched in isolation, these episodes present a different Doctor. If this was the only Tennant story you’d seen, I think you’d have quite a unsympathetic view of him. He spends much of the story being rude, unhelpful and snide. The target for his shirtiness is UNIT Colonel Mace (Rupert Holliday-Evans). The Doctor doesn’t like Mace because he carries a gun. “I don’t like people with guns hanging around me”, he snarls at one point. Well, I say “one point”. Actually, the script seems to hammer this home every five minutes. And he doesn’t like salutes and he doesn’t like being called Sir. OK, we get it: the Doctor doesn’t like the military. Except… he does actually. Most of the time, he’s completely fine with it. He makes a show of ambivalence about it, sure. But openly hostile to it? No. It’s a tricky relationship and one it’s easy to over egg. Play it too stridently, as is done here, and it comes off as forced and inherently false. In DWM prior to this story’s transmission, showrunner Russell T Davies said about this story that “UNIT’s back properly”. UNIT, a mainstay of the Pertwee years, had been poking its head around the door of the new series a couple of times, but there hadn’t been a major, trooper stomping, gun firing presence in a story since Battlefield in 1989. Interesting choice of phrase, Doctor. Home being the place where one might find a family. And the words “UNIT” and “family” go together in Whodom. If you’ll forgive the straining of a metaphor, Pertwee’s Doctor was the mother hen, the Brigadier the exasperated henpecked father. Yates and Benton were the boisterous teenage brothers, Jo Grant the trendy, unattainable sister, and the Master the family’s black sheep. But it’s the bromance between the Doctor and the Brigadier which is of interest here. The Brigadier carried a gun, and the Doctor hung around him and his armed buddies for years, long after his Earth exile ended. And in stories as far flung as The War Machines, The Invasion, Resurrection of the Daleks and even last random’s Aliens of London we’ve seen the Doctor happily consort with soldiers. For a long time in the 70s (or was it the 80s?) they were even his “family”. And here, at last, is the thing; that family members love each other, despite their differences and their bickering. It’s this love which allows them to solve problems in different ways, but still get on. It’s why the Doctor loves the Brigadier, even though he carries a gun. And it’s why The Sontaran Stratagem/The Poison Sky does not feel like UNIT is back properly. Because it doesn’t recreate the Doctor’s relationship with UNIT, which was based on respect. Grudging perhaps, but still it was there. And you really feel for poor old Mace, being barked at by the Doctor simply because he’s not the Brigadier. In The Poison Sky, he makes the misjudgement of ordering five soldiers, including the Doctor’s newfound buddy, handsome Ross (yes, he liked him, although he also carried a gun. Flighty git! ), to engage the Sontarans in battle. He does so against the Doctor’s advice and the men are killed. The Doctor is furious, but I find it hard to blame Mace. Why should he listen to Dr. Sanctimonious who’s been insulting him constantly since they met? It’s no way to build trust. And in the end it’s Mace who orders in the Valiant to clear the air around the factory. It’s Mace who presents a solution to the bullet jamming whatsit. And it’s these two actions which allow UNIT to recapture the factory and for the Doctor to capture Martha’s clone and regain the advantage. The Doctor doesn’t thank him, of course, and we never get a scene where the two reach detente and recognise the strength of the other’s approach. So you make your hero a smug, unlikeable bore at the risk of alienating your audience. And when it comes to guns, this Doctor doth protest too much. He’s worked with the army willingly in the past, and many companions and allies have walked alongside him packing heat. He’s even carried and used them himself, on occasion. And at the end of this story, he cobbles together an atmospheric igniter gadget. It burns up the poison sky, and then he converts it to work on Sontaran air. Basically, it’s a bomb. He teleports himself on to the Sontarans’ ship and delivers an ultimatum to chief badass Staal: leave or I blow you up. He’s effectively pointing a gun at Staal’s potato head. But he’d never carry one of those, right? Right. This is completely different. LINKS to Aliens of London/World War Three: Both have UNIT and both have aliens using human simulacra to infiltrate positions of power. But in a link back one step further to Death to the Daleks, once again the story ends with a character blowing themselves and the monsters up. In fact, this story’s suicide bomber, Luke Rattigan, like Galloway in Death, dies in an act of redemption for his wicked ways earlier in the story (and in the act, taking revenge on his former allies). I’m sure we’ll encounter this trope again, so let’s christen it the Sacrificial Blam! NEXT TIME… I could murder a cup of tea. 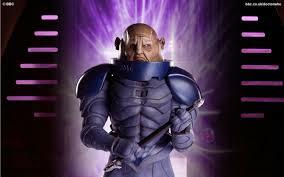 We’re sticking with Sontarans for The Time Warrior.